The 5 x 7" Art Profolio Advantage Presentation/Display Book from Itoya is an excellent choice when it comes to presentation and storage. This simple, stylish and functional book says you are a pro who does quality work and is proud of it. The 24 pages it comes with contain acid-free inserts which protect your work. The book features binding that will keep the spine flat when it is opened. No more fumbling with the pages with one hand while you try to talk to the art director with the other. Box Dimensions (LxWxH) 7.45 x 5.85 x 0.85"
Art Profolio Advantage Presentation/Display Book (5 x 7", Black) is rated 4.8 out of 5 by 14. Rated 5 out of 5 by Mountain hiker from Excellent photo display Smaller size easy to store and show. Small enough that it's easy to present your photographs quickly. I carry one around with me in my camera bag. Rated 4 out of 5 by Jen from Perfect size and price I am just starting up a small business selling blank greeting cards with my photography. I create 5x7 cards and have a lot of information on the back of the card that I'd like for people to see. I've pulled out the black sheet that comes in each sleeve so customers can see both the front and back of the card as they turn through the book. I'll probably pick up at least one more - small, lightweight and they look professional. I've just begun to use it so I can't speak to the durability of the sleeves or book but I'm very happy with it so far. Rated 5 out of 5 by Pamela from Perfect for the job The size is perfect to carry around to show potential customers my veggie and food photos. The hard cover of the portfolio has saved my prints a number of times when it got bounced around in my vehicle or dropped on the ground. The sleeves are very clear so they don't detract from the prints at all. Rated 5 out of 5 by Ben S from Excellent quality I have several sizes and variations of the Itoya presentation books, and always enjoy using them. They are made of quality materials, inside and out, and are perfect to carry with you, either for casually sharing your photos with friends, or for formal presentations of your work. Rated 5 out of 5 by Anonymous from Art Profolio Art Profolios are perfect books for storing and presenting photos. They are professional, they are not bulky and thy are easy to use. The photos slip easily through the top opening and the plastic sleeves are clear . Rated 5 out of 5 by Phil from Truly clear & clean pages The pages in this presentation book are clearer than anything else that I have seen. I've looked around a lot for (archive) quality presentation, and this is as good as I have found. Rated 5 out of 5 by f-Stop Bill from Great Purchase This is my second purchase of an Itoya Art Portfolio. Their portfolios are well constructed, handsome, stand up to a lot of use, and are reasonably priced. Rated 5 out of 5 by Yoshinori from You can not find this size at any art-supply shops. I am editing any pictures by the prints. I could not find this size (5x7) any art-supply shops. I live to use for a small album and picture editing book. Can you stock: Itoya Art Profolio Advantage Presentation/Display Book (11x8.5&quot;, Black) Horizontal. 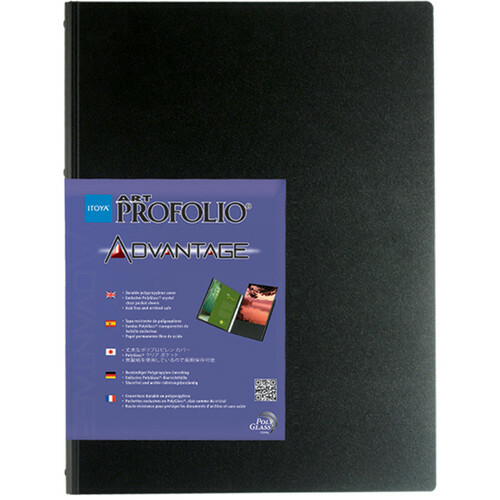 And Itoya Art Profolio Advantage Presentation/Display Book (17x11&quot;, Black) Horizontal? Thank you.